BMW Concept Ninety pays homage to the R 90 S | Throttle Life! 90 years of BMW Motorrad, 90 years of two-wheeled history – hardly another motorcycle manufacturer can boast such a longstanding and successful heritage as BMW. The BMW R 90 S likewise has cause to celebrate: the BMW Motorrad design icon turns 40 this year. As a tribute to both these anniversaries, the BMW Group has presented the BMW Concept Ninety in partnership with the custom bike company 40 years of the BMW R 90 S.
Back in 1973, BMW unveiled its flagship model in the “Stroke Six” range to the global public. Boasting a top speed of just over 124 mph, it was one of the fastest production bikes of its day and went on to claim numerous prizes in a variety of race series. Together with its sporty tail end and striking Daytona Orange paintwork, it endowed the BMW R 90 S with an unmistakable identity. The design of this bike pointed the way forward, and it wasn’t long before other manufacturers were gracing their motorcycles with aerodynamically honed front and rear fairings. The BMW Concept Ninety resurrects this spirit of the emotionally charged superbike, translating the emotionality and inspiration of the earlier model into a contemporary guise. This is a modern reiteration of the traditional essence of the motorcycle: the harmonious unison of man and machine – pure and emotional. The BMW Concept Ninety takes to the stage as a sporty boxer with a battery of sophisticated details. Its basic proportions clearly take their cue from the forebear that inspired this concept: the fairing, tank, seat and tail instantly signal its family bond with the BMW R 90 S. The BMW Concept Ninety also picks up on the demarcation of the bike’s proportions that was a hallmark of the time. The upper ergonomic and aerodynamic bodywork is visually separated from the black engine and chassis. The bodywork is hand crafted from aluminum. Its brushed areas can be seen in the tinted areas of the front fairing and tank, as well as at the tail. 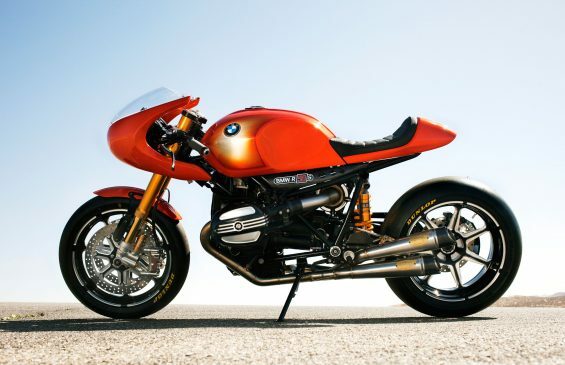 The rich orange shade of the BMW Concept Ninety is also a nod to the legendary Daytona Orange paintwork of the BMW R 90 S.
Unlike other custom bikes, the BMW Concept Ninety can be – indeed begs to be – ridden. The motorcycle and all its components have been designed with top performance in mind.